Do you ever feel overwhelmed by standards, learning targets and creating engaging lessons? Have you ever questioned the real meaning of a standard? Do you enjoy having all your materials and ideas in one notebook? Do you feel overwhelmed trying to match a teaching strategy to a standard? Are you an instructional coach or reading coach? 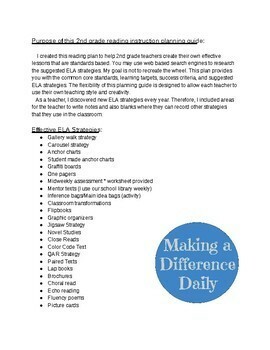 The purpose of this reading planning guide is to help teachers create and organize their own effective standards based lessons. It is also designed to help teachers ensure they teach all the reading common core standards properly. 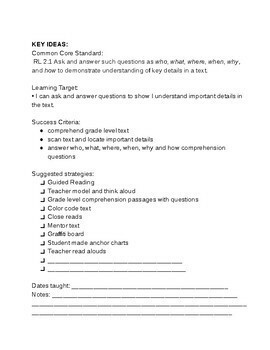 This plan provides you with the standards, learning targets (I can statements), success criteria checklist, and suggested reading teaching strategies. 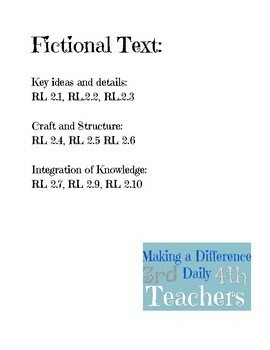 You may use web based search engines to research the suggested reading teaching strategies. The flexibility of this planning guide is designed to allow each teacher to use their own teaching style and creativity. As a teacher, I discover new reading strategies every year. Therefore, I included areas for you to keep notes and also blanks where you can record other strategies that you use in your classroom. This planning guide may be utilized every year. 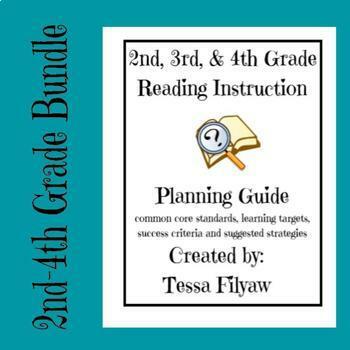 This product also helps teachers understand reading standards taught in previous grades along with future standards. The knowledge of other grade level standards help teachers to build a strong foundation for the future grades.